There are quiet moments when you dream bleary-eyed dreams of exploring green forests, rugged coastlines and inhospitable wildernesses. For a fortunate few, the dream becomes a reality; all that is needed is a vehicle in which to explore the remote corners of the country – or, perhaps, even the globe. 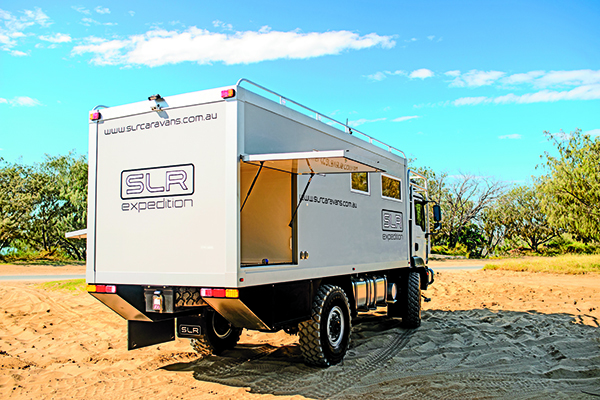 One particularly intrepid traveller had such dreams and commissioned Gold Coast-based RV manufacturer SLR Caravans to build him a vehicle capable of roaming through the most remote, challenging and beautiful spots around the world – a vehicle built for true global adventures. 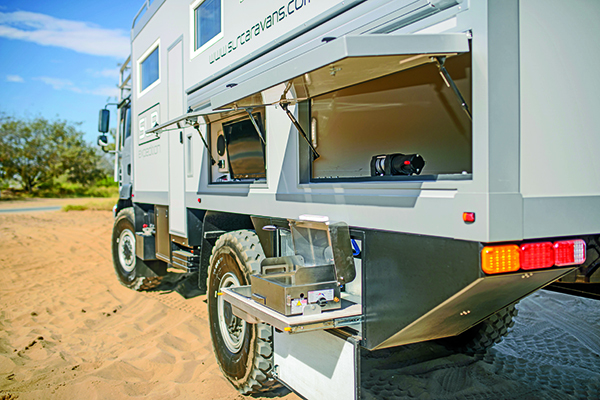 SLR Caravans reckons it has met the challenge with its custom-built Commander 4x4 expedition vehicle. And, on looks, it’s just the sort of thing you need to take on the task. Touted as easy to ship anywhere in the world and decked out accordingly, your travel horizons are expanded immeasurably. I packed up my literature-fuelled dreams of exploration and took them to SLR’s Gold Coast base to see for myself. SLR built the Commander on the back of a MAN TGM 18.340 4x4 truck. Weighing 10t and with a travel height of almost 4m, this is a truly imposing machine. MAN Australia boasts that the TGM is a blend of intelligence and comfort thanks to its 12-speed TipMatic automated transmission, MAN EGR common rail engine and a range of other features. Driver comfort is maximised by the fully adjustable air-cushioned driver and passenger seating, and power is supplied by an impressive high torque engine that delivers a whopping 1250Nm of torque at 1200rpm. It’s easy to say it’s got the mechanical oomph you’re likely to need on an extreme adventure. With that amount of power to the ground, this massive truck will haul you along the highway, crawl up incredibly steep ascents, drag you through deep snow and sticky mud, and inch you over the rockiest terrain until your cheeks hurt from smiling at the sheer enjoyment of it. The Commander’s impressive credentials don’t stop there. The truck is fitted with Michelin XZL military-grade tyres, which justify their hefty price tags by boasting self-cleaning, open shoulder tread design and other features that enhance both traction and flotation capabilities, making them ready for snow, sand, mud and bitumen, with extra casing protection against most offroad hazards. What’s more, the tubeless construction is compatible with the Commander’s central tyre inflation system, which means convenient control over the air pressure in each tyre. Even if with that grunt and those tyres you did manage to get stuck, don’t worry. This motorhome comes with a custom-built winch to help haul you out. And in case you need extra reassurance, or are just looking for more fun, the Commander has a storeroom for a quad-bike at the rear. 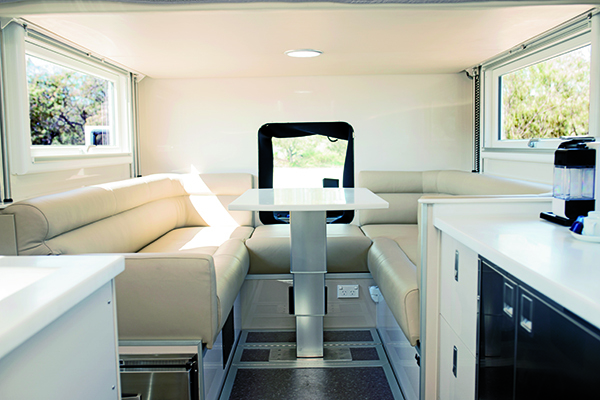 The motorhome body has 60mm fibreglass composite panelling, providing both strength and insulation. To cope with extreme cold (which you’re likely to face on an adventure to the icy northern reaches of the globe), double-glazed, gas-filled windows are fitted, which provide better insulation, reduce power consumption when in camp and reduce window condensation. For the same reason, the Commander’s water systems are insulated for sub-zero temperatures and a Webasto diesel combi system means you’ll enjoy a cosy warm cabin, hot water for a long shower, and heat for the cooktop. And you needn’t worry about that long shower – this truck has the ability to carry a formidable 800L of fresh water and another 150L of grey water. 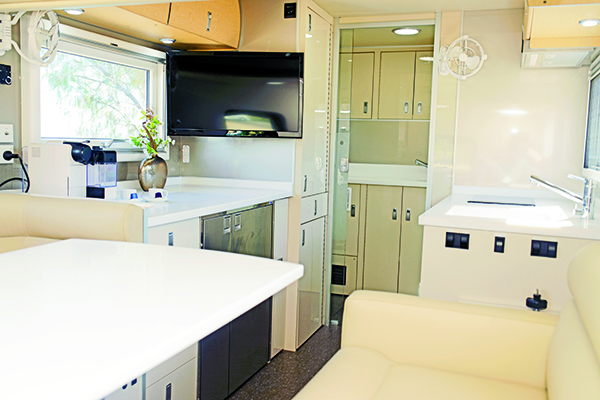 While ducted air-conditioning helps keep a comfortable cabin climate, the Commander’s other features include an Autosat satellite TV system with a 32in TV and a Fusion stereo with twin speakers and an iPod dock helping provide entertainment outside, as well as an LED TV for entertainment inside. Extreme adventures in the most isolated, beautiful areas are all about living outdoors. So if you want to make the most of a sunny day while on expedition in the Great Rift Valley, somewhere between Kenya and Mozambique, then you can enjoy cooking up a storm on the small, but handy, outdoor barbecue under the electric awning. And if you run out of sausages, in addition to the cold storage provided by the under-bench fridge-freezer in the kitchen, there’s a convenient freezer under the dinette seat adjacent the entry door where you can easily grab a few more to chuck straight on the barbecue. Unfortunately, other than having plenty of cold storage, gourmet travellers won’t find too much culinary joy in this massive offroader, because the stylish kitchen is only equipped with a small benchtop cooker and a microwave. The Webasto diesel cooktop is a great innovation, offering a place to cook and an area to warm meals, but it’s only a one-burner cooker, meaning you can only work with one pot at a time. The external barbecue helps to combat this problem, but it does mean you need to carry gas as a second fuel source. The cabinetry and furniture throughout the Commander – from the stylish rear ensuite through to the well-made art deco-inspired overhead cupboards – are all first rate. In fact, this is the overall hallmark of the interior, particularly the quality lounge upholstery. There are plenty of cupboards and drawers for storing necessities in the kitchen and bathroom, although the design could benefit from some robe space. There is also under-floor storage in the dining area, but I thought it was a little too shallow to be really practical. However, the real show-stopper is not the furniture quality or the electric lift-up king-sized bed that lowers down over the lounge area. It’s what lies above it. Immediately over the bed is a large skylight that draws the mind to imagine resting under a warm, star-studded sky. 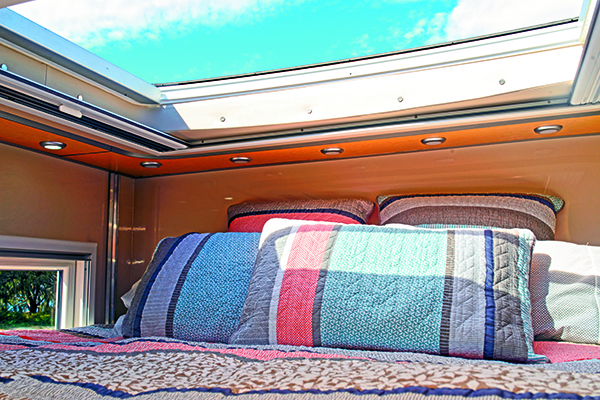 It transforms what might otherwise feel like a cramped sleeping space into a restful, open area. For my money, despite having the exterior ladder pointed out to me, I rather liked the idea of climbing out the skylight and sipping a cool pinot on the roof, while admiring both the magnificent view and the moonlight skipping across the six 150W solar panels – ah, now that’s living. The solar panels provide sufficient DC power to two 360Ah lithium batteries or AC power thanks to a 2500W Mastervolt inverter. These batteries are integral to a power system that, when connected to external AC, is able to operate on any voltage, worldwide. When it comes to dreaming of great global adventures, the 10t SLR Commander 4x4 motorhome is sure to turn the well-heeled traveller’s dreams into reality. This is a remarkable expedition vehicle, providing the ability to tour even in the harshest and toughest terrain, with a grab-bag of features that are sure to make the journey a comfortable one. So if you don’t mind a price tag of $600,000 and are certain to demand sophisticated luxury, a rugged truck with plenty of torque, well-crafted furniture and a host of fittings that include a sophisticated power system, skylight, military tyres and space for your quad bike, then this is a worthy global expedition vehicle. It’s perfectly suited to those carefree souls with the time (and money!) to enjoy the grand adventure. The full test appears in Caravan World #554 October 2016. Subscribe today for the latest caravan reviews and news every month!